Our appointment with Dr. Shah went really well today. He wants to see us back in about 3 weeks and talked about putting me on bed rest in the hospital in 8 weeks...not something I am happy about! Our goal is to make it to 32 weeks-which would put us somewhere into October. I'm really hoping to still be doing well when we go back and convince the doctor that I can stay home on bed rest for a while. 10-12 weeks is a LONG time to be in the hospital--especially when I know that Jacob will be busy with school by then and won't be able to visit daily. I would be put into Fairview Hospital--not far yet not convenient either! This is our biggest baby. He measured to be 5 days ahead of schedule. He sits alone at the bottom of the pack with the most room to stretch out and obviously grow! Giovanni receives his middle name from Jacob's Grandpa Alferio. 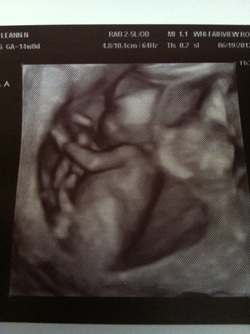 She was curled up in a ball the entire time we got to see her. She measured to be 3 days ahead of schedule. She is positioned right in the middle of all of them so I'm sure she is already learning to be patient! Brooklynn receives her middle name from Leann's Grandma Truman in hopes she will be able to bake apple dumplings as well as her grandma. She was also curled up most of the time we were able to see her. Jade measured to be 1 day ahead of schedule. She is the other baby positioned in the middle so she doesn't have nearly as much room to spread out and stretch. This name was chosen on our own liking; we really liked it and thought it was time to start a new family name to be passed down. Our wild child proved to be just that still! She measured to be right on schedule at 14 weeks. She receives her middle name from Leann's Grandpa Truman. As you can see in the pictures he is ready to prove himself to be the one most like Jacob! He measured 2 days ahead of schedule. He receives his middle name because Jacob and his dad both share that middle name as well.